Now I’ve always been a fan of Stella McCartney… From perfumes, to the joint ventures with Chloe and Adidas, street-edginess to couture glamour, she’s one that has always delivered and is quite under-rated in the fashion world (in my opinion)… So it’s no surprise to me that she’s given wedged shoes a whole new look for this autumn season. 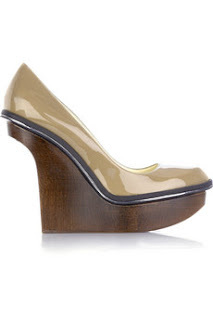 (Wooden Wedge Pumps £495) I love the quirkiness of this shoe. 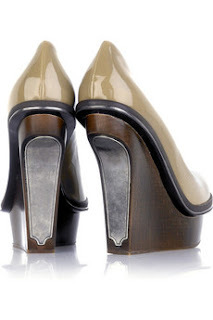 The Taupe patent upper oozes sexiness and has an air of sultry authority- accompanied with the sculpted wooden heel inset, it’s one of the hottest shoes in the game right now.